As weather continues to prove unpredictable and summers get hotter, the number of major wildfires around the world seem to be increasing in frequency and severity. Knowing how to prepare for a wildfire or forest fire and how to respond to this kind of natural disaster can make all of the difference if you find yourself in immediate danger. With seasons becoming more volatile each year, the risk of serious wildfires breaking out is believed to be growing. The destruction caused by forest fires and wildfires is undoubtedly devastating to homes and lives, but what causes them and what can be done to prepare for a wildfire ahead of time to mitigate the adverse effects of this kind of disaster? In this guide we’ve taken a look at how to prepare for a wildfire to ensure that if one strikes where you live, you’ll be ready to respond and react without a moment’s hesitation. A wildfire is the term given to a large and destructive kind of fire that spreads quickly and with devastating effect over areas of combustible land or vegetation. Also known as wildland fires or forest fires, wildfires are uncontrolled fires which tend to occur during periods of particularly dry or hot weather when areas of vegetation (such as grasslands, scrub, forests, and other wooded areas) are most vulnerable to igniting. It’s due to this that areas traditionally associated with warm, dry summers and which are also home to large areas of woodland, grassland, or prairie, are most prone to this kind of natural disaster, providing both the fuel and the conditions for an uncontrolled blaze to get going with ease. With the very real possibility of changing climate conditions around the world, it’s little wonder that hotter and dryer summers are not only increasing the frequency and intensity of traditional wildfire hotspots, but are also causing fires to form in areas not traditionally associated with this kind of disaster. Due to this, the likelihood of increasingly hot summers, and longer dry periods make the possibility for wildfires occurring more frequently, as well as in more locations, probably higher than it’s ever been before. It’s with this in mind that the importance of knowing how to prepare for a wildfire becomes a crucial consideration if you live in an area that may potentially be susceptible to this kind of extreme emergency event in the near future. The basic premise behind a major wildfire is incredibly simple, when a large area of dry, combustible material (like a forest during summer) is exposed to the smallest of flames or sparks, it can trigger an almost unstoppable chain of destruction and a fire that spreads at an unbelievable rate. The thing that tends to exacerbate the situation with the majority of these wildfire events is that the initial source of the fire may be many miles away from the point at which someone actually notices that a fire is underway and potentially raging. This of course means that it can be hours before people are actually alerted to the fact that a wildfire has taken hold, at which point it’s too late to extinguish it before it takes hold. In terms of what causes a wildfire to start in the first place, the culprit can range across an almost uncountable number of factors. It’s estimated that in one form or another, the majority of wildfires (perhaps as many as 90%) are started either inadvertently or deliberately by humans, while the remainder can be put down to natural causes. With humans representing the highest cause of wildfires starting, the importance of knowing how to care for, and extinguish a fire should never be overlooked and are of vital importance if starting a fire in a wilderness setting. Before a wildfire strikes, there are a lot of things you can do to make sure that you and yours are ready if an emergency situation begins to unfold. 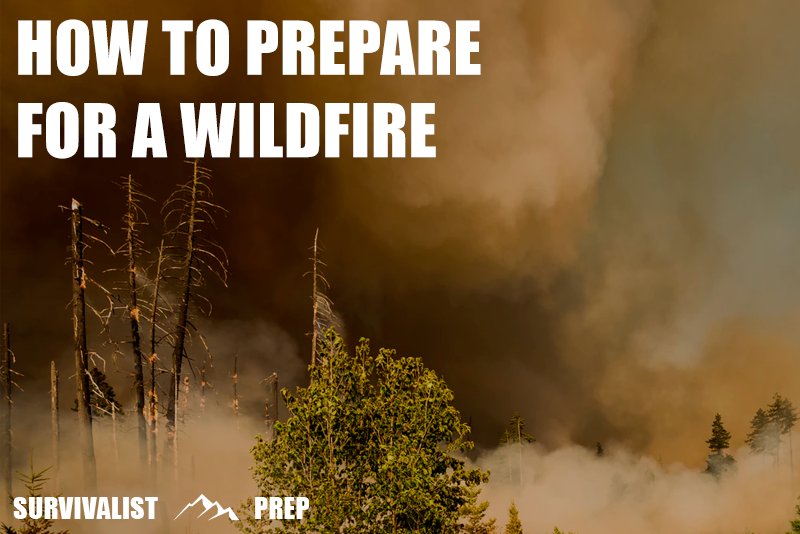 The general rules and concepts surrounding knowing how to prepare for a wildfire are built around the key survival factors for most natural disasters and serious emergency preparedness situations. With this being said, there are of course a whole load of scenario specific steps that apply to preparing for a wildfire event which won’t be applicable in other instances. If you live in an area of forest, grassland, or brush, these steps will put you in the best position to protect yourself against the dangers of being unprepared if a major fire breaks out. Knowing how to prepare for a wildfire and the steps to take ahead of time will ensure that if the worst comes to pass, you’ll be able to respond quickly and effectively, minimizing disruption and distress. Knowing how to prepare for a wildfire means knowing how to prepare for a wider disaster or emergency situation and in all of these cases, building up your home preparedness and resilience is the first step. Preparing a home emergency kit will mean that you’re covered in the early stages of a possible wildfire (which may still be many miles away) and can react quickly if the situation deteriorates or requires an immediate course of action be taken. A wildfire may already be underway elsewhere for example, but its effects might be felt in your home nonetheless – in the form of a prolonged power outage or blackout for example. Depending on where you live, access to usual infrastructure and logistics could well be damaged by major wildfire activity elsewhere. To reduce reliance on external systems and services, look to cover the essentials of home preparedness planning such as maintaining access to clean drinking water and adequate nutrition to see you and your family through the long haul if needed. If it looks likely that you’re going to need to evacuate your home ahead of an approaching wildfire, the last thing you want to be doing is gathering up your supplies. Let’s be clear, if it seems that evacuating your home is going to required – time is everything and every single second counts. With this in mind it’s absolutely crucial that any supplies, tools, equipment, and gear you need to get out of the home and away as quickly as possible are packed, checked, and ready ahead of time. A bug out bag or grab bag is the first element of your evacuation strategy and loadout, containing everything you could need to survive for around 3 days or possibly longer. The bag you pack should include everything from food, water, and first aid supplies, to shelter and vital documents. If you don’t own a car, truck, or other vehicle, you’re going to be covered by step 1 above and should look to evacuate on foot to safety, either to the nearest ride out of town or according to instructions given by the authorities. If you do own a vehicle, making sure that it’s emergency-ready alongside packing with all of the supplies and equipment to allow you to evacuate by road is going to be an essential planning step to take ahead of a disaster. Think of your evacuation vehicle as being a larger way in which to carry essential survival supplies, as well as needing to be a self-contained method for carrying any and all equipment and tools you may need for vehicle maintenance on the road. In a wildfire evacuation scenario, your vehicle is quite literally going to be the lifeboat that gets you out of harm’s way as quickly as possible. Make sure it’s packed, ready to roll, and fully maintained at all times to minimize headaches when you need it most. One of the most effective ways to minimize the chance of a wildfire taking hold on your home is to remove every and any source of immediate fuel that could increase the risk of the flames spreading. Remove all combustible material from the immediate vicinity and surrounding areas of your home to greatly reduce the chances of an approaching fire destroying your property. Things like dried branches, wood, leaves, and other flammable debris should be removed as a matter of priority. Having a well rehearsed plan in place is one of the best ways of making sure that when an emergency arises, you know exactly what to do without even thinking about it. Remember those school fire drills when you were a kid? Well the same principle should hold true in preparing for a wildfire, house fire, or for that matter, any other emergency or disaster situation that needs everybody out of the house and implementing a survival plan as quickly as possible. The goal of almost all preparedness and emergency survival around response and evacuation is to minimize the reaction time when crisis strikes and to ensure that the next steps to be taken become second nature so you don’t have to rely on thinking during the heat of a crisis. Getting into a routine whether it’s once a month or once a year of practicing how to react and what to do in the event of an emergency is one of the critical success factors when it comes to getting out of danger safely and quickly when times are bad. A comprehensive first aid kit is probably the survival essential to have at hand in almost any situation, allowing you to triage and stabilize a whole load of injuries and ailments until immediate danger passes or help arrives – whichever is sooner. Preparing for a wildfire is no different in this regard. Ensuring you have a sufficient number of first aid kits in strategic locations will mean that you’ve got the right equipment and supplies to hand if you need to deal with an injury quickly (either your own or someone else in your group). As mentioned above, having a well rehearsed plan in place is going to get you in good shape if you ever need to implement an emergency reaction plan. Build this around a physical/printed plan that everybody is familiar with and is easy to grab and carry if disaster strikes. An emergency plan should cover all eventualities and should include the steps for all family members to take if the time comes as well as the roles and responsibilities of each member of the household. Look to include contact details and essential information on the plan as well as contingency information or extra detail regarding what to do if family members are separated before or during the emergency. Good practice here is to produce multiple physical copies (ideally laminated) as well as keeping a digital and easy to access format of the plan that members of the household can access on a computer or phone if they’re away from home. It might sound obvious, but one of the very best things to do in preparing your home for a wildfire emergency is to ensure that you have enough smoke detectors around the property. Useful for more than just fires within the home, a bunch of high quality smoke detectors will be one of the first lines of defense if a wildfire breaks out nearby, alerting you to the danger outside and allowing you to put your response plan into action as soon as possible. If you don’t own any already, buy enough smoke detectors to sufficiently cover your entire home – the general rule of thumb is that you want to have one detector for each floor of the home and for each bedroom. A particularly good route to take if you’re buying new detectors or upgrading existing ones is to consider investing in a set of smart smoke detectors which are able to ‘communicate’ with others in your home as well as directly to you (via sound and light on each device and through your smartphone) to let you know something’s not right. Beyond fitting smoke detectors around the home, there are a lot of steps you can take to mitigate the effects a fire has if it reaches your property. Look into fitting sprinklers or keeping a quick-fit sprinkler system close by to call on when it looks as though a wildfire may be approaching and it’s time to evacuate your property. Invest in fire extinguishers (both for the home and for carrying in a vehicle) as well as fire blankets. If you live on a farm or on a ranch, it might seem like leaving animals in a barn or shelter is the best course of action during a wildfire. The fact of the matter however is that doing this is no different to locking yourself in your home when you should be getting out – if the fire reaches the structure, things wont end well. The chances are that if you don’t have time to evacuate them ahead of time, leaving them sheltered may be preferable for their own safety. Consult with local fire department officials or other authorities about how best to handle animals or livestock in a wildfire situation. As with all of our preparedness guides, we reference as many expert sources, real world user reviews, and opinions as possible so we’re able to provide the most relevant and educational information on how to prepare for a wildfire or forest fire if disaster strikes. Knowing how to prepare for a wildfire is ultimately a highly personal activity with individual needs and preferences sometimes varying considerably between people, locations, and specific situations. With these considerations in mind, this guide looks to provide advice on our own opinions of how to prepare for a wildfire, however, it’s always important to carry out your own due diligence to find the best solution for you when developing a strategy, plan, and solution that’s perfect for your situation.